I hadn't realized it, but the Dryden and Ithaca school districts are among the few in the county that still have a junior varsity football program. Lansing also has one, and Trumansburg's closed this fall. The pictures with the article are of the Dryden team, and there's some good discussion of why JV is a good complement to varsity football on many levels. There's also a very strange correction to the police monitor, clearing a Dryden teen of an armed robbery charge and instead noting his arrest and that of another Dryden teen in a different robbery. Every town had its notable characters. Every town had its gathering places. Dryden had several barbershops where the locals gathered for haircuts, shave, and more importantly, to exchange the local news of the day. No person or event escaped their notice or comment! Bob Watros and Laurence (Beachy) Beach will sit a spell in the old chairs from George McKeon's barber shop and recall the stories about the local merchant, politician, teacher, banker, farmer, doctor, violin maker, police chief, gardener, musician, gossip, liar, and vagrant that were topics of conversation in the barbershop. Join us, and bring your recollections that will add to the storehouse of tales about Dryden's notable characters. Free and all are welcome. Parking and elevator access off George Street. 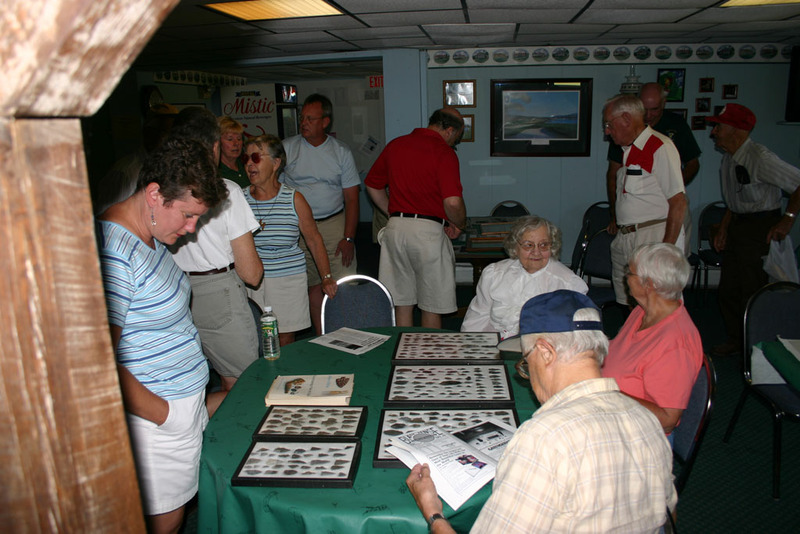 Back on August 21st, the Dryden Town Historical Society held a program at the Dryden Lake Golf Club, exploring the Dryden Lake area from its earliest times to the events of the past few years, when dedicated volunteers put their money and their energy into keeping the golf course going. Dryden Lake Golf Club logo. The presentation started with Doug Norton's discussion of his collection of arrowheads, which he'd found in nearby cornfields. 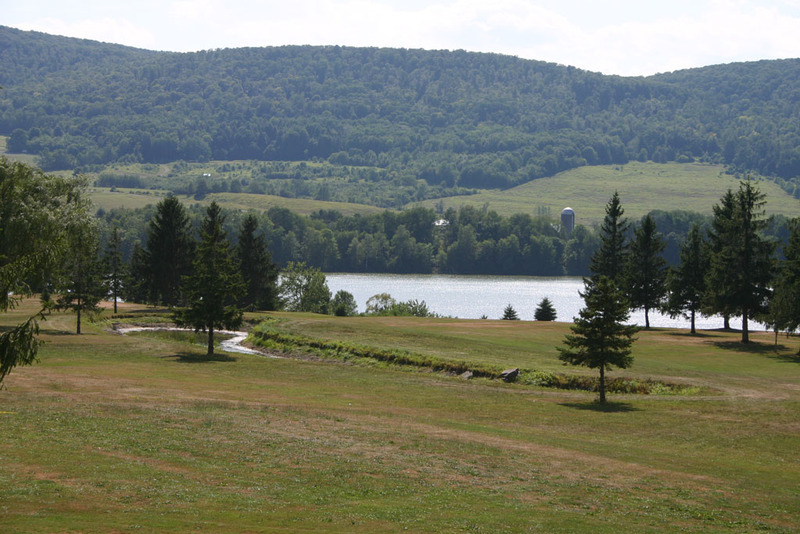 There was also talk of an archeological sponsored by SUNY Cortland, which found artifacts corresponding to a hunting and fishing camp on the lake, but not a permanent village. Millie Norton pointed out that Ruth Sweetland has a mortar and pestle that dates back to this period. The lake was in Onondaga Nation territory at the time of the American Revolution. Looking at arrowheads and other artifacts found in the area. Sib Stewart and Ruth Sweetland talked about the farms and families in the area, and how change over the centuries had affected them. Stewart talked about ice production on the lake, and the many icehouses at all the dairy farms surrouding it. We would have preferred, of course, for it to remain a golf course. In fact, it was my passion and the passion of a lot of other people to keep this very beautiful place open and I do believe it is the most beautiful place in the world. When I come back to Dryden and come back down Route 13 from Cortland and see the hills just embracing this beautiful area, I know that I have come home... So it was my passion to keep that open to the public as a place where anyone could come and enjoy the view. View from the clubhouse deck. Hill and Norton explained the deal they arranged with owner George Szlasa to create a limited liability company (LLC) to keep the course running, and the hard work volunteers put into cleaning up the clubhouse, repairing and rebuilding the machinery, and maintaining the grounds. The course is back to being nine holes, par 33, from its recent problematic eighteen hole configuration. If you'd like to know more, and there's lots more to see, stop by the Dryden History House some Saturday from 10:00am to 2:00pm and read Marilyn Adriance's transcript of the session, or visit the gallery of pictures I've posted. Best of all, you can visit the course itself. We need to leave Iraq. Our time there diminishes our reputation in the world. Our actions in Iraq increase the anger and resentment that erupts in terrorist acts. And we are neglecting our own citizens, their health, their education, their general welfare. Where are the good ideas? In county news, there's an article comparing District Attorney candidates George Dentes and Gwen Wilkinson. There's also breaking news that TCAT and its union have reached a deal, avoiding a possible strike. This week's Dryden Courier leads with stories on Freeville's Foxglove Bed & Breakfast, which has been in business since 1997, and the upcoming visit of the Harlem Wizards to take on a team of Dryden school staff and coaches. The Wizards game will be held on Wednesday at Dryden High School at 7:00pm, and is a fundraiser for the Dryden Booster Club. There's also an article on Betty Postle's volunteer work at Freeville Elementary School, marking 35 years of volunteer service. There's a very strange item in the police log, where an apparently inebriated Ithaca man broke into a house on North Street, pulled a wood stove off the patio, left while the resident called the police, and came back to get the stove again 45 minutes later. Police watched him try to load the stove in his car and then arrested him. It is said that decisions are made by the people who show up.... Those people that finally showed up were able to have the decision made in their favor [to delay adoption]. So, to the residents of the Town of Dryden: take this opportunity now to go over the comprehensive plan and speak your mind. You have some more time to do so. To the members of the Town Board: once again, congratulations on a fine decision, and one in advance for getting the job done. But we ask that you not delay the decision any more than it already has. The time for this to be implemented has come. In sports, the Lansing-Dryden boys soccer match was postponed because of lightning, Dryden girls soccer beat Groton 4-0, and Lansing beat Dryden in girls swimming. This morning's Ithaca Journal visits a computer animation studio on Sunset West, Maas Digital. Dan Maas began his work at Cornell and continues it today in Dryden. You can see his work for the Mars Rover video simulation - there's even a section on how it was made. Maas was nominated for two Emmy awards in July for his work on PBS' show NOVA. In county news, there's more detail on the contract between TCAT and the UAW. Today's Journal is largely quiet about Dryden, though the Groton Town Talk notes food pantries from 1:30pm to 2:30pm on October 8th and 22nd at the McLean Community Church. There will also be a steak dinner fund-raiser at the McLean Community Church on the 8th from 5:00pm to sold out, and a community bazaar from 9:00am to 2:00pm on the 15th at the McLean Fire Hall. On the opinion page, incumbent District Attorney George Dentes argues that traditional probation is the only Alternative to Incarceration he sees as cost effective, while challenger Gwen Wilkinson supports Drug Court and other ATI programs, noting that among other things, drug courts have been repeatedly found to be cost-effective, and that they have bipartisan support, all the way to the White House. The Journal's editorial congratulates TCAT and its unions for hammering out a contract, but warns of a lot of work yet to come. While not yet public, the environmental review for the county's proposed emergency communications network is complete. The County Legislature will also be voting on establishing a fund for preserving open space tonight. It's not quite in Dryden, but 50 years of Milliken Station, now AES Cayuga, seems worth noting. Despite the magic of the grid, it's reasonable to suspect that electricity generated there in Lansing may have been used in Dryden. In county news, there's an article about library funding, as the library received $50,000 on top of its earlier budget request, but not the $338,000 it had requested. County Legislators Martha Robertson and Mike Lane both voted for the $50,000. The residential price for natural gas, once just $6.37 per 1,000 cubic feet in New York in early 2000 and $11.02 this January, has already spiked to $14.94. That's a 36 percent increase in less than eight months, and the DOE expects that price to jump more. Home heating oil, as low as $1.44 a gallon in New York at the outset of winter 2003-04, stood at $1.99 one year ago. Two weeks ago, the DOE predicted that price could top $2.94 a gallon, up more than 48 percent from one winter to the next. I'm very glad my house is now insulated with an upgraded furnace, but I suspect my cash savings was temporary. Better to lose the savings than be paying massive new bills, though! This morning's Ithaca Journal reports that the death of a Freeville man in an ATV accident Saturday has been reported accidental. There's also more reporting on the county budget, including $45,195 for the Board of Elections, $39,193 for the Department of Social Services, and $108,879 for the Health Department. County Legislator Mike Lane encouraged legislators to add $30,000 to funding for Tompkins County Area Development, but was voted down. Unlike Dryden's 1968 General Plan or the currently proposed Comprehensive Plan, both of which looked at the recent past and projected change (and responses to change) based on more of the same, another plan for Tompkins County considers a future in which one key variable has changed substantially. I wondered last year what $3.00 gas would do to Dryden, and then I saw it actually appear here. (It shot up another 50¢ before coming back to the $2.97 on that sign.) Now, looking at increasing demand for oil with few signs of new discoveries to match, I'm wondering whether in the long term the steady price of gas might be $5.00, or $6.00, or worse. Natural gas prices are skyrocketing as well, and while the world has natural gas, it's not nearly as easy to transport as oil, and North American stocks aren't growing to keep up with demand. research and document an emergency plan for relocalizing the production and distribution of essential goods and services in Tompkins County in response to an economic crisis precipitated by an irreversible, perpetually increasing rise in the price of oil. Part 1, the Overview, looks at energy issues, most of which are far away from Dryden, but which affect everything from the cost of driving from here to Lansing to the cost and availability of groceries in the store and the price of fuel for winter heat. It sets out the reasons why we may want to start finding our goods closer to home - 'relocalizing' the economy - than we presently do. It was long-distance distribution and the ever increasing cost of fuel that first prompted Cornell University researchers, about 15 years ago, to look into a system that could grow produce year round, even in the northeast's harsh climes. Thursday's gas price hikes, where, locally, a gallon of unleaded went at least as high as $3.29, illustrated precisely the situation these hydroponics were intended to offset. "The idea was to substitute electricity for diesel fuel because electricity comes from many sources," said Louis Albright, a Newfield native and Cornell professor. And do I expect this all to happen? I'm hardly certain, but definitely glad to see someone thinking about what to do if it does. The current spike in gasoline and natural gas prices has me thinking about energy conservation more than usual, and wondering how far this all will go. "They're afraid we're going to put in the 40 miles of trail and take their land away, and that's crazy," said Steve Trumbull, the town supervisor. In the proposed plan, there are 20 miles of finished trails suggested along with another 19 miles of unfinished trails. If the town adopts the comprehensive plan, as Trumbull expects, there is no obligation for the town to pursue creation of the recreational trails. According to Barbara Caldwell, chair of the town's planning board, the first item likely to see action, after the plan is adopted, is the municipality's subdivision regulations. Right now there is no reference to clustering, a planning tool the town would like to encourage. When developers cluster homes, the intent is to concentrate development on a site, leaving larger swaths of open space. The warm weather we've had may dim fall foliage, though I'm still enjoying what we have. I also missed an article yesterday, which visits the Greater Ithaca Art Trail, starting in Eva Capobianco's studio on Turkey Hill Road. Cathy Wakeman's Dryden Town Talk column looks at tomorrow night's "Barbershop Stories with Bob and Beachy", talking about McKeon's barbershop where many of the tales were told. The Dryden Town Historical Society will be hosting the event, tomorrow at 7:30pm at Village Hall (map). Wakeman also notes next Friday's Sertoma Spaghetti Dinner, to be held at Dryden High School. Briefly in Dryden lists a leadership workshop series to be held at TC3 starting October 21st. A possible 1.55% increase in the county tax levy. A ban on burning of household trash that will take effect in a few months. A look at disaster preparedness in the county. District Attorney challenger Gwen Wilkinson and incumbent George Dentes squared off at a League of Women Voters community forum. There are also columns by Dentes and Wilkinson on today's opinion page, talking about campus crime. The Journal's own editorial encourages voters to participate in November 8th's local elections. Finally, directions for sending fall foliage pictures to the Journal are available. There isn't much Dryden news today, but at the county level, the Legislature passed a preliminary budget with a tiny tax levy decrease by a 13-0 vote yesterday. There will be a public hearing November 9th and a final vote November 15th. said tapping into the room tax to pay for department expenditures could become a "slippery slope," because other departments that need additional employees could argue they should receive room tax funding too. County Legislator Martha Robertson also voted no on that one. On another vote, however, Totman and Lane supported adding a deputy out of general funds, while Robertson remain opposed. The motion failed 9-5. I was late getting there, unfortunately, but Assemblywoman Barbara Lifton and County Legislator Mike Lane held a press conference today announcing $50,000 in state funds for equipment for Freeville's W.B. Strong and Dryden's Neptune Hose Company fire departments. 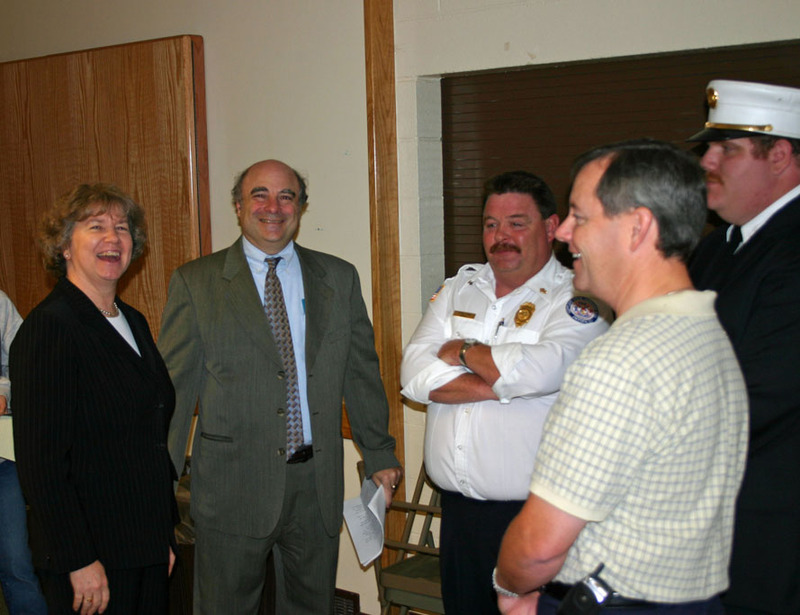 Assemblywoman Barbara Lifton, County Legislator Mike Lane, Neptune Hose Company Chief Ron Flynn, Neptune Hose Company Board Member Dan Tier, W.B. Strong Chief Andy Down. I don't usually post press releases, but as I missed the main event, it seems like good compromise, and there's useful information about where the money's going. Assemblywoman Barbara Lifton and Tompkins County Legislator Michael Lane jointly announced today that they have secured New York State capital funding to assist the Dryden and Freeville Fire Departments to obtain sorely needed special equipment for emergency preparedness. The $50,000 in funding will go to purchase such things as emergency generators, thermal imaging cameras, multi-gas meters, technical rescue items, and additional equipment to provide for firefighters' personal safety. Assemblywoman Lifton said: "I am pleased to have been able to work with Mike Lane to get state funding to the Dryden and Freeville fire departments for the purchase of critical equipment. Mike was aware of the fire departments' needs and asked that I try to secure this funding for them, and I am very pleased that Speaker Silver approved the project." 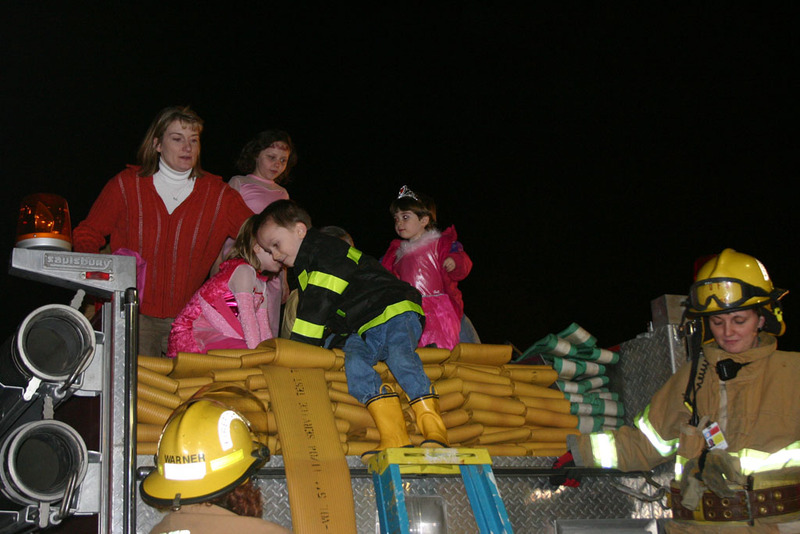 Legislator Lane commented Volunteer firefighters in this district undergo extraordinary training, and are ever vigilant to provide a high level of emergency services to the public. To make them most effective, they must have up-to-date equipment to render quick and effective lifesaving protection for the people of Freeville and Dryden. In seeking funding for their departments, Dryden Chief Ron Flynn and Freeville Chief Andy Down stated that "Smaller communities across the state struggle to find money t o help fund special equipment purchases that increase the level of preparedness without having to raise [local] taxes." When I arrived, Town Councilman Steve Stelick was talking about how the town is also addressing similar needs, and that Freeville was taking $10,000 of the $15,000 it was receiving in this grant and reducing their 2006 funding request to the Town by that amount. After some discussion, the Dryden Town Board approved the Comprehensive Plan tonight, minus the "spiderweb" of additional trails added in September. At the end of the meeting, the board considered both the State Environmental Quality Review (SEQR) and the plan, adopted with modifications in a resolution proposed by Councilman Mike Hattery. Hattery's proposal originally seemed kind of mysterious, as only board members had copies, but Hattery read the resolution and described the changes after the SEQR was complete. Town Attorney Mahlon Perkins gave me his copy, so you can read the resolution including the changes for yourself. The net result was to shift the trail map back from the March 25th version (295KB PDF) to something resembling an older version (301KB PDF), minus the trails shown in the Irish Settlement/Ferguson Road area and the Ellis Hollow trail, though the latter is still listed as for "further study". 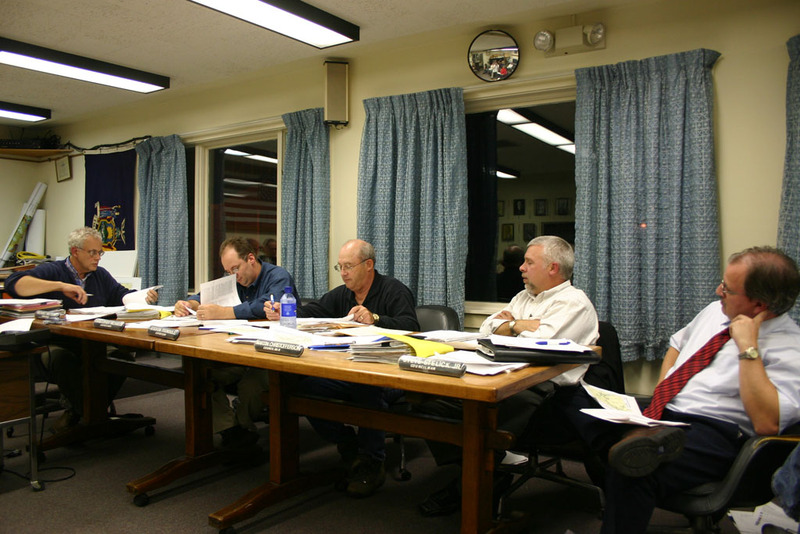 Town Board performs environmental review before approving Comprehensive Plan. Councilmen Steve Stelick and Hattery were especially concerned that the plan get regular updates, and Planning Board member David Weinstein sounded enthusiastic. He also noted that the Planning Board was looking forward to some implementation in the near future, especially cluster subdivision possibilities. This morning's Ithaca Journal reports on Thursday night's Town Board meeting, where the comprehensive plan passed with modification to the trails. The Journal also notes that the New York State Department of Transportation will be reducing speed limits on Route 79 in the Town of Dryden from 55mph to 45mph; County Legislator Martha Robertson reported that in a letter she got from the DOT. Martha was instrumental in starting the TompkinsRx prescription drug discount card plan -- county residents without drug coverage can now save 20-25 percent on their prescriptions. Affordable healthcare for struggling residents is a priority for her. She fought against state mandates that have shifted the tax burden to local communities and with her help the county Legislature won a cap on the county's share of Medicaid expenses. On issues that we bring up, she is always ready to listen and work hard to provide solutions. She understands the needs of local businesses and of the many farms that dot our county. She is committed to working for housing options for the diverse families that make up our community. She works to keep Dryden residents informed of local issues and planning, and to involve them in the process. Yes, Martha is responsive and eager to help residents resolve their concerns. There's also a report on preparations for flu season this year. Who paid for this billboard? I know, I know. The bit at the end of an ad that says "I'm George Bush, and I authorized this message" isn't the most exciting bit of political advertising. But these days, especially when nominally "non-partisan" groups are out there pouring money on races in the hopes of turning them their way, it seems more necessary than ever to say who paid for what. Clearly someone thought about the design, and they figured that change is such a good thing that no one would ask what kind of change. They didn't, however, spend any of the vast space they have there explaining just who paid for this. Eventually campaign finance records should out this, but it would be nice to know when the sign goes up. Was it the Town of Dryden Republican Committee? Was it the shadowy Coalition for Change? My bet's on the latter, as Park (who owns that billboard) donated them early cash, and because Tom Hatfield, the only person I've heard speaking on behalf of the Coalition for Change, also happens to be the Chairman of the Town of Dryden Republican Committee. We Democrats aren't perfect either - we have an ad in this week's Shopper, which will be fixed in the next issue, in which we left off the paid for item. Similarly, Republican George Dentes is running ads for his District Attorney campaign in the Dryden Courier which lack information about who's paying. But wouldn't you think, just maybe, if you're putting up a huge billboard that screams "we're spending a lot of money to buy this space," that you might actually mention who paid for it? Update: Tom Hatfield reports that the Coalition for Change didn't pay for that billboard. Rather than tell me who did, he tells me it will come out eventually in the financial reports. I have to say - and publicly, since there's this huge billboard out on Route 13 - that I think that's completely the wrong attitude to take. One of my earlier pieces about the importance of energy drew a comment about things we can do now. Come to a FREE 2-hour workshop to explore low-cost and no-cost energy saving ideas that will help reduce your household's energy bills. Each participating household will receive a free kit of energy-saving items worth about $30, including weatherstripping, caulk, plastic window insulation, refrigerator thermometer, and more. Refreshments and door prizes. Free and open to the public, but advance registration is required. 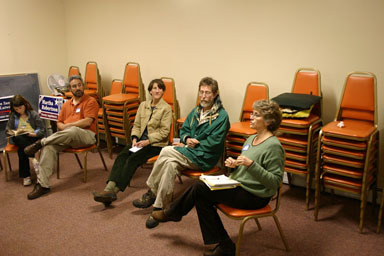 Workshops to be held at: CCE Education Center, 615 Willow Ave (map), Ithaca. To register, call 272-2292. There are also links to more energy-saving information on the page listing the workshops. The public is welcome to attend - you don't have to be a Democrat. The League of Women Voters didn't seem to be running its past debate series, so we thought that it would be helpful to have a session where the public can meet them. 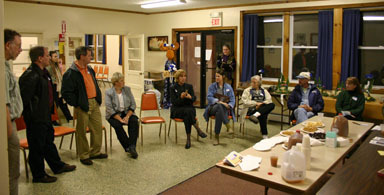 We doubted that the Republicans would want to give our candidates the extra air time of talking with their incumbents. Apparently there may have been more interest in that than we thought, so we'll see what happens. If you'd like a bit of a preview of one Town Board candidate's views (and hopefully more soon), visit the Dryden Democrats weblog. This announcement, like everything that appears on Living in Dryden, is paid for by me. Dentes has prosecuted successfully a decade of criminal cases, just two examples offhand are: [...] the pervert who assaulted, murdered and dismembered two Dryden cheerleaders; are off-the-streets along with dozens of other criminals who could make your county unsafe. John B. Andrews, was arrested on Oct. 7, 1996 and weeks later indicted for the murder of two Dryden cheerleaders. Two days after being indicted, on Nov. 2, 1996, Andrews committed suicide in a Tompkins County Jail cell. The case was never prosecuted by District Attorney George Dentes. In brighter news, the SPCA has welcomed five dogs left homeless by Hurricane Katrina to its Hanshaw Road shelter. Also, you may (if you live in Dryden or anywhere in New York) be happy to know that you live in the sixth-safest state in the nation, according to a recent FBI survey of police statistics. Since 1994, crime in the state is down 44.9%, with violent crime down 51.9%. I've been slack in covering the Dryden Courier lately, and I should cover it while it's still available. This week, it's even been available for free at the XtraMart at the Sunoco station on the Route 13/366 overlap with any purchase, so it's a good chance to check out the local weekly. The Courier visits BB Farms, also on 13/366, and talks about its evolution from a sale in a parking lot to its current incarnation with a barn and all kinds of products. Pumpkins are popular now, and they'll be selling Christmas trees later. The Courier also reports on a "skate equipment exhibition and tryout" held at Montgomery Park to see how much interest there would be in building a skate park in memory of Chris Ackley, who was collecting petitions for one when he was killed in an accident June 14th. 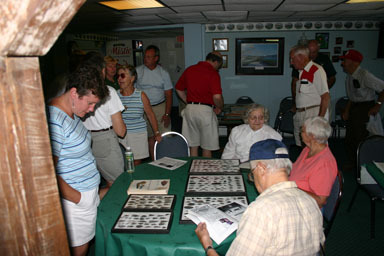 His parents have talked with both the Village of Dryden and the Town of Dryden, and the Town sponsored the exhibition event. There are two letters to the editor on the opinion page, one from Jim Skaley supporting Martha Robertson's re-election campaign for county legislature, citing her work on the TompkinsRx card and a Park and Ride for the Varna area as two key reasons to support her. Another letter from Kevin Kimber recommending Paul Lutwak for Town Board, citing Lutwak's fiscal conservatism, his background as an outdoorsman, and his being "an innovative thinker, a careful planner, and a consensus builder". In sports, the Courier reports on Dryden's 2-0 loss to Lansing in boys soccer, and notes Dryden graduate Landon Allmendinger's success playing for TC3 men's soccer. I have in front of me information I requested that shows legislators' voting records on the 2005 budget. Out of 15 legislators, Mike Lane ranked 13th in votes on spending. Every single Republican on the Legislature called for more spending than he did. Meanwhile, back in Dryden, during Mike's opponent's tenure on town board, the tax levy suddenly sprang upward by nearly 18 percent. The 2005 budget voting record information is available. Where Lane was #13 on spending more, Republicans had slots 5, 6, 7, and 8, and Lane's total was less than half of the thriftiest Republican, George Totman. Yesterday was so action-packed that I didn't get to cover the Journal, so here are yesterday's and today's papers. "Getting qualified employees that are actually being educated locally ... could help because these resident-type people who are already here are building up skill sets," said Zach Schulman, a partner in Cayuga Venture Fund, which has helped launch a number of local start-up companies in scientific or technological fields. ...Even though a lot of technology has been coming out of Central New York lately, local funding is limited and most of the companies are small, Henderson said. Larger companies may be hesitant to move or remain here, he said, because they don't see a large, skilled workforce to draw from. "Really, the TC3 program is one of the things that can help that," Henderson said. "You can train that workforce, and you can grow companies." Briefly in Dryden didn't appear in yesterday's online edition, but it lists a turkey dinner at the Freeville United Methodist Church at 4:00pm Saturday, and registration for workshops at TC3.biz. At the county level, the legislature unanimously passed the tentative county budget for next year, putting it to public hearing November 9th and a possible final vote the 15th. There's also mention that a Draft Environmental Impact Statement for the County's proposed emergency communications network is available. There will be a public hearing November 3rd, and the comment period ends November 18th. Martin and Susan Hatch write to say that "Dentes is wrong!" about the cost of Drug Courts, citing Tompkins County's spending on sheriffs (middle), probation (high), and jails (low) to suggest that Tompkins County is avoiding high jail costs that taxpayers would otherwise be incurring. Bill Cornell of Dryden writes in support of Legislator Mike Lane and District Attorney candidate Gwen Wilkinson, saying that "Both are competent and dedicated public servants who are very involved with their communities." Linda Wagenet writes to support the re-election of County Legislator Martha Robertson, writing that "Martha has proven herself to be an active, involved legislator who sincerely works for the good of all the residents of Western Dryden. She listens to the concerns of her constituents and is well-reasoned and thoughtful in her explanations of the way county government works." The only Dryden-related item in today's Ithaca Journal is in Briefly in Tompkins, which notes that the Dryden Senior Citizens will be holding their fund-raising bazaar on Saturday from 9:00am to 2:00pm at the Dryden Fire Hall (map). The race for District Attorney looks set to get ugly, as incumbent George Dentes made claims about challenger Gwen Wilkinson's involvement in a child abuse case in his column yesterday. Wilkinson held a press conference yesterday to refute those claims and press further on findings of Dentes' own misconduct. There's one key item I think the Journal got wrong. They write that "The civil case is pending," while Wilkinson's press release states that "I represented DSS in negotiating the settlement in this case that ended the case prior to trial stage, and was agreed to by all parties." There's also a report on the Ithaca High School newspaper restarting. Parking will be at Ann's house or if you prefer you can park at the parking lot and walk over. There will be a brief meeting at 8:30 to discuss what needs doing where, sign the Friends Of Hammond Hill DEC work crew list and then we will split into multiple work crews. If you arrive late, there will be a map and directions where to find those work crews that could use your help the most. It would be most helpful if you email Ann an RSVP of your intentions to assist so she can determine if there will be enough help to make it worth ordering the culvert and gravel. redflea210@frontiernet.net or 844-8706. Best to use email if you can. 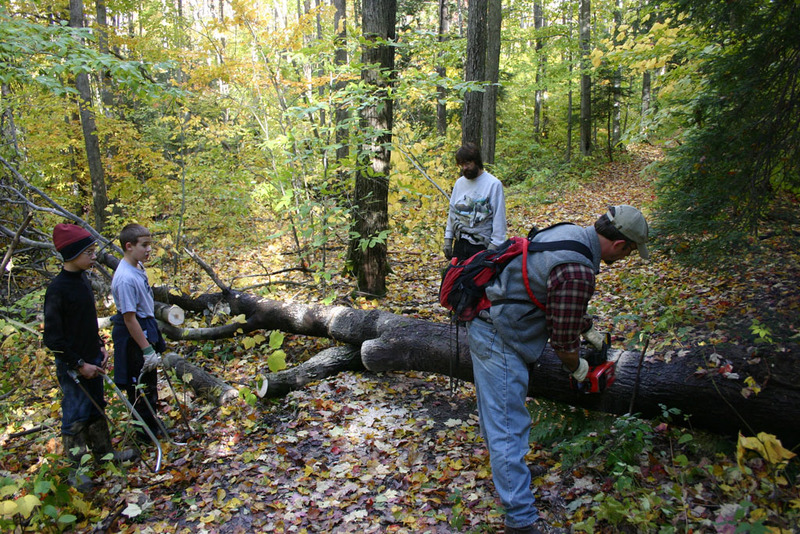 Tools to bring: saws, axes, loppers, shovels, hoes, rock rakes, maybe one more chain saw with practiced operator. (Jack Rueckheim and Mike Ludgate are bringing theirs) Check with Jack, Mike or Ann re chain saw! The Ithaca Journal's news section is quiet on Dryden, noting again that the Dryden Senior Citizens will be holding their fund-raising bazaar today from 9:00am to 2:00pm at the Dryden Fire Hall (map). The Journal's reporting on Thursday's League of Women Voters forum somehow manages not to mention any of the county legislature races in Dryden at all. On the opinion page, however, there are perspectives from Democratic candidate Athena Kalandros and Republican candidate Duane "Tyke" Randall II on how they would represent their district, which includes Groton, the eastern edge of Lansing, and the northeastern corner of Dryden. In fact, Ms. Robertson has a better fiscal voting record than the Republicans in the county Legislature. Meanwhile, her opponent and his party crow about high taxes, speak of crumbling infrastructure, and endorse spending on facilities that we don't need - all while pushing tax cuts and corner cutting as the cure all for the county's problems. Her opponent's and his party's proposals do not make sense. Just across the town line, on Game Farm Road, Cornell dedicated a new raptor facility. As I'd announced earlier, the Dryden Democrats held a Meet the Candidates forum at the Varna Community Center on Wednesday night. Democratic District Attorney candidate Gwen Wilkinson, County Legislator Martha Robertson, and Town Board candidates Paul Lutwak and Mary Ann Sumner spoke about what they hoped to accomplish and the skills they bring to the jobs. County Legislator Martha Robertson talks about TompkinsRx. We had unexpected (but pleasant) attendance from the Republican candidates for Town Board, incumbent Steve Stelick and newcomer Dan Tier. While they mostly got to hear from Democratic candidates, they also spoke about what they hope to achieve in the next few years. District Attorney candidate Gwen Wilkinson (center) talks about prosecution. Unfortunately, only about eight non-candidates were there, though on the bright side I think that did make it reasonably easy for people to get their questions answered. This week's Dryden Courier leads with a picture of last week's press conference at which County Legislator Mike Lane and Assemblywoman Barbara Lifton announced $50,000 in funding for firefighting equipment at Dryden's Neptune Hose Company and Freeville's W.B. Strong. $35,000 at Dryden will pay for an emergency generator to let the fire hall operate as an communications center in case of emergency, while $15,000 in Freeville will purchase imaging cameras, gas meters, and other firefighting devices. There's also an article on the Dryden Central School District's efforts to improve their math curriculum, "aligning the entire math curriculum within the district." There's also mention of the possible formation of a chapter of the Points of Light Foundation's Kids Care Clubs, recognition of the girls soccer team's 14-0 record (now 17-0), and reports on Hurricane Katrina relief and concessions. Town board members were put between a rock and a hard place. They said over and over again that they would never use eminent domain for recreational use, yet they were bombarded with residents voicing complaints at town meetings. So the board made a change in good faith, to ease concerns of the residents. It's the people, not the plan. Plans are needed to ensure the character of the town; to ensure Main Street in Groton doesn't become a strip mall and that rural sections of Lansing remain separated from the commercial district. They offer guidance, but provide flexibility for changes and revisions as the town grows and the needs change. But the people who run the town are where the power lies. They make the decisions that are going to affect the property owners. They are there to serve the people, and it's the people's responsibility to ensure the right representatives are chosen. My enthusiastic support for Michael Lane for reelection to the County Board from District 14, stems from my admiration for the steady good sense he has demonstrated over many years of untiring public service to the Village of Dryden as mayor and to the County in its legislature. The Police section lists a Dryden man's DWI and an assault in Dryden. There's also an article on the challenges Tompkins County's Department of Social Services will face in the Home Energy Assistance Program (HEAP) - the rules for qualifying for the program were eased, but fuel costs have increased while the budget remained stagnant. As I campaign around the County, I find that many people are unaware that the Rockefeller drug laws are dead. Even my opponent was unaware of this. She started campaigning hard against those laws, until she heard me say they were repealed last year. The Rockefeller Drug Law reform bill signed by Governor Pataki on December 14 ... does not fundamentally change the State's approach to drug addiction and drug crime. First-time offenders convicted of Class B street-level sales still face mandatory imprisonment, and those with a prior felony conviction will still only manage to escape prison with the consent of a prosecutor. (From summary (114KB PDF) by New York State Defenders Association. George Dentes frequently seems to be the last person in New York State still supporting the Rockefeller drug laws, whatever their cost to taxpayers may be. There's good reason "many people are unaware that the Rockefeller drug laws are dead" - they aren't. Perhaps from his extreme position even modification looks like repeal? Or maybe it's just convenient to push that unique perspective during election season. ...HEAVY WET SNOW IS POSSIBLE IN THE HIGHER ELEVATIONS. THE POTENTIAL EXISTS FOR TREES AND POWER LINES TO COME DOWN DUE TO THE WEIGHT OF THE SNOW. ROADS ALSO COULD BECOME SNOW COVERED AND SLIPPERY. A significant weather event will begin to play out tonight over the Southern Tier and last into Wednesday, bringing heavy rain and -- if the conditions are just right -- the possibility of snow. The players include Hurricane Wilma, a tropical depression named Alpha (because we've run out of regular names and have since moved to the Greek alphabet) and an upper-level low moving across the Ohio Valley and Great Lakes. If they all decide to get together at just the right moment, they could create a so-called "perfect storm," spreading heavy rain and even heavy snow across southeastern New York, northeastern Pennsylvania and already water-logged New England. "This is going to be a tricky set- up over the next few days," said Josh Nagelberg, a meteorologist with AccuWeather. "It will get really interesting as this cold air dives south over the Great Lakes. As all this sets up over the coast, it could be cold enough for rain to change over to snow. And there's a potential for some heavy snow, especially in the higher elevations over the Catskills and Adirondack Mountains." "A lot of it is due to timing," Nagelberg said. "Will we see 3 to 6 inches of snow? I doubt it. But it is still possible." I just got the latest voter registration data from the Board of Elections this morning. I thought I'd compare registration in Dryden to last year, and was pleasantly surprised. Most parties have lost members, with only the Working Families and Libertarian parties showing an absolute gain. However, the Republican party lost over half (108) of the overall (210) drop in registrations, while the Democratic party only lost 9. The Greens show a catastrophic drop from 130 to 99; I wonder if that's because the BOE is clearing out voters who may have registered Green for the 2000 election but have moved away since. Democrats held a 138-vote registration lead over Republicans last year; now it's widened to 237. Of course, registration alone doesn't win elections - those people have to come out and vote. This morning's Ithaca Journal looks at energy-efficiency improvements in houses, visiting Freeville resident Derek Osborne, who sounds like he's doing about the same work to his 1920s house as I had done to mine a couple of years ago, and Rosalie Borzik, who's looking for ways to save energy. I'm especially interested to see that the Village of Freeville is actively involved, polling households about energy use and figuring out how to help. We'll see what happens tonight with the snow for higher elevations. There's also a meeting Thursday night at 7:00pm at the Ellis Hollow Community Center (map) to discuss the replacement of the Ringwood Road bridge over Cascadilla Creek. Gwen Wilkinson, the Democratic candidate for District Attorney, will be having a meet the candidate session at the Ellis Hollow Community Center (map) on Thursday, from 5:00pm to 7:00pm. Cider and cookies will be served. Athena Kalandros, candidate for County Legislature in Legislative District #9, will be holding a Meet the Candidate event hosted by the Elm Tree Inn on October 30 from 1-3 pm. The Elm Tree Inn is in the center of McLean at 2 McLean Cortland Road across from the Post Office. Legislative District #9 is comprised of the Village and Towns of Groton, the northeast section of the Town of Dryden north of Malloryville Road, and the section of the Town of Lansing east of Van Ostrand and Breed Roads. This will be a great opportunity to see old and new friends and neighbors, meet and discuss issues that concern you with the candidate, and snack at an historic local inn. I haven't been able to write about the budget like I did last year, but I'm afraid it's harder when there's an election going on. Since the budget hearing is Thursday night at 7:00pm at the Dryden Town Hall, it seems worth at least getting the budget out to people ahead of that. I'll try to write something coherent about what all of this means tomorrow. Reading the town budget is unfortunately a pretty difficult exercise. While it clearly presents comparisons of this year's spending to last year's spending by category, those categories are often pretty vague. On the revenue side, there's no simple listing of the money coming in, broken down by, say, sales tax expectations, reserves, interest, and unspent cash, and then the property taxes that are usually everyone's focus. I'm especially concerned about sales tax expectations, as the Town of Ithaca, which draws from the same pot of sales tax revenues as Dryden, is planning a 22% tax levy increase because of "conservative estimates for sales tax revenues." The unexpended balances for a lot of categories on the cover page rival the revenues for a lot of categories, and I'm trying to figure out why, for instance, the "Revenues" for Total Townwide 2006 are $1,359,990 and the "Amount Raised" (from property tax) is $958,525 - but "Unexpended Balance" for that category is $1,087,000. Looking at the bottom line - the tax levy and tax rate, this is the first time in three years that the tax rate has dipped, from $1.477 to $1.436 per thousand dollars. That said, though, the tax levy has increased again, from $914,241 to $958,525, or 4.8%. That's an improvement over last year's 7.9% increase, but it marks the second consecutive year where the town tax levy increased more than the county's. And the year before that saw an 8.5% increase in the town tax levy too. The best part? The tax rate had stayed the same (within a penny) since 2003 - so if you just talk about rate, it looks like the Town Board has held the line on taxes and given a small cut this year. Unfortunately, the rate hides the tale of rising assessments, and the steady increase in the property tax levy since 2003, while the town has been in solidly Republican control. After years of hearing rhetoric about "free-spending Democrats," I never thought I'd find myself in the party of fiscal responsibility, but somehow Democrats have done a better job of lowering the tax levy over the past decade in Dryden than Republicans. The Tompkins County SPCA's Hanshaw Road facility is bulging with dogs and cats in need of homes. Built for 38 dogs, they now have 54, as well as 291 cats. The usual fall drop-off in occupancy hasn't happened this year, and it's a great time to consider getting a new pet, and the Journal has pictures of four to consider. The Etna Community Church will be having a Fall Festival this Saturday from 1:00pm to 3:00pm. The Dryden Town Historical Society Pie and Bread Sale will be next Saturday, November 5th, from 9:00am to sold out at the First National Bank of Dryden. The article says "usually by 11 a.m.", but I'd recommend getting there sooner. Illusionist Toby Travis will be having a show at the Reach Out for Christ Church on November 9th at 7:00pm. Local Boy Scouts and Cub Scouts will be collecting funds for hurricane relief through the Salvation Army at Clark's Food Mart. Mr. Lane has been an effective legislator who is always eager to hear the concern of his constituents and to carefully consider their views. His record is one of fiscal integrity and a common sense approach to issues. His goal to change the current annual property assessment plan to provide for re-assessment every three years should provide a level of property tax relief for the citizens of Tompkins County. Over the last four years, under this vice chair's stewardship, the Tompkins County actual tax rate has risen 26 percent while the actual tax levy has risen approximately 31 percent. Note: During two of these four years, a double-digit increase in both the tax rate and tax levy occurred. Meanwhile back in the Town of Dryden, over this same four-year period, the Town's tax rate went down 12.94 percent while the tax levy rose approximately 2 percent. 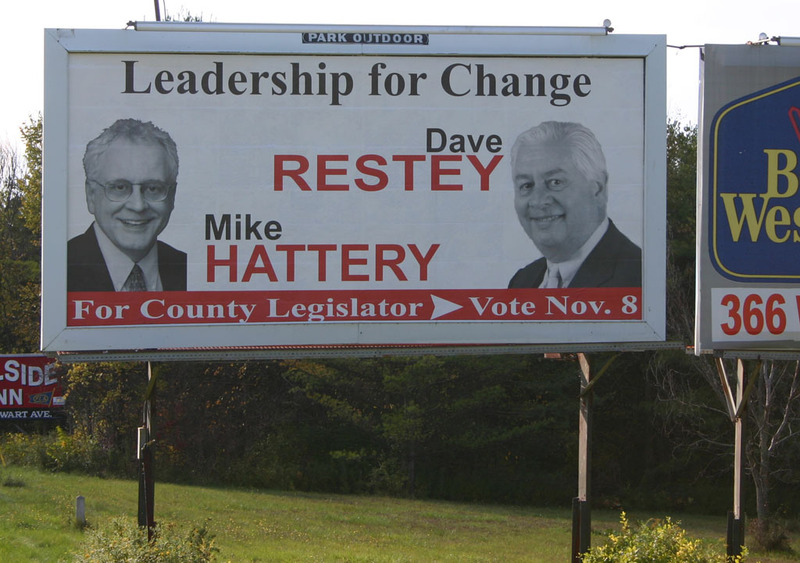 Note: District 14 legislative candidate opponent Mike Hattery was involved during the last two years as a Dryden town councilman. Taylor carefully omits noting that the last two budgets, the two in which Mike Hattery has been directly involved, as I just wrote earlier, had town property tax levy increases of 4.8% and 7.9%, both greater than the county's 0% and 6.5% increases in the same period. 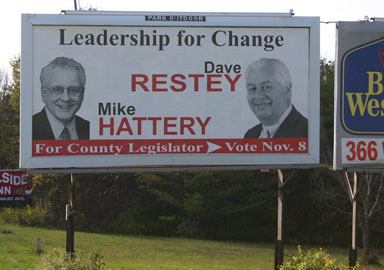 It may be fun to attempt to give Mike Hattery credit for tax decreases that took place under a Democratic Supervisor before he was on the board, and to be sure to count the two years when the county was under the heaviest pressure from state increases in pension and Medicare mandates against his opponent, but it doesn't stand up to careful examination, and it very definitely isn't "apples to apples." There's also another round of columns from incumbent District Attorney George Dentes and challenger Gwen Wilkinson, this time discussing their qualifications. Unfortunately, Dentes manages to claim once again that the Rockefeller Drug Laws have been repealed, when they very clearly have only been reformed, lightly. Perhaps living up to their name as "the Grand Old Party," the Dryden Town Republican Committee will be having a Meet the Candidates event this next Friday night, November 4th, from 7:30pm to 9:00pm at the Dryden Fire Hall (map). The ad for the event in The Shopper calls the Republicans a vote for intermunicipal cooperation, open government, and fiscal responsibility, which sounds eerily like the Democratic flyers I've seen of about the last ten years. Steve Stelick does have a separate ad listing his accomplishments of the last four years. I was too busy yesterday to sit down and write, but there wasn't much in Dryden news in yesterday's Ithaca Journal, except for a couple of pieces that fit well with today's paper. The Journal's head-to-head pieces on the opinion page include County Legislator Martha Robertson and challenger Dave Restey yesterday, and County Legislator Mike Lane and challenger Mike Hattery today. There was also a letter from Richard Couch of Freeville supporting Lane yesterday, and a letter from Kevin Kimber of Dryden supporting Paul Lutwak in the Dryden Town Board race. In local news, there's an overview of the District 9 race between Athena Kalandros and Duane "Tyke" Randall II. Two pieces on energy appear in the print edition as well. There is a supplement on saving energy with all kinds of information about reducing home energy use, and a piece on the New York Public Service Commission's rejection of a plan to divert money from energy efficiency to direct payments for low-income customers. I don't see any sign that NYSEG offered to reduce its own rates to these customers, so it looks painfully self-serving. Take the cash now, and keep it out of the hands of programs designed to reduce energy use for those same customers over the long run. NYSEG would both get the money and make more later selling energy that might not have been needed otherwise. Even with the rejection, they'll no doubt paint the PSC as the enemy of the poor. They're not - they just have a longer-term vision that isn't quite as nice to NYSEG as NYSEG would like. WHCU finally has a new website. It's thoroughly cluttered, but at least the key piece of information I want to see - the Casey Stevens guest schedule - is at the top of the right-hand column. There has been a tremendous response to the call for action from our terrific trail enthusiasts! Thank you, one and all, who have responded so far and welcome to all you who haven't stepped up to join us yet. 3 chain saw crews (one chain saw boss and several "haulers" per crew) Two of these crews will find 4 WD motorized transport useful to points closer to their destinations. Good idea to "carpool"
1 gravel crew. We'll need 6 to 8 people here. Nice for people with limited time, or who are bringing young children who chill quickly, as this crew will be working close to home base. We will have a tractor to assist with gravel moving so wheelbarrows will not be necessary. 1 or 2 wandering crews to clear ditches, pick up fallen limbs (there is lots of this stuff) trim back bent trees and low branches. For the dish to pass, there will be refrigerator and freezer and stove all available for use. Ann has table service enough for about 20. If you can bring dishes and table service for your own use, that would help tremendously. We'll be using regular tableware and washup as we go, better than filling our landfills with throwaway junk. We look forward to seeing all of you on Sunday at 8:30 (or whenever you can join us) Remember that standard time kicks in this weekend! The Town Board approved the budget on Thursday night with minor corrections (which I've added to the list). The budget has a property tax rate of $1.436410 per thousand, down from $1.477628, for a decrease of 2.8%, while the tax levy climbs from $912,241 to $958,525, for an increase of 4.8%. At the meeting they also approved the special permit for Autoworks to use the old F&T Distributing Building. David Moore, who had strongly opposed it in September, wasn't there. The board gave official support to a grant application by Neptune Hose Company, and briefly discussed some possibilities for a skate park, noting safety and liability concerns. They also talked about a town resident with a $31,000 sewer bill because of a long series of meter misreadings, but took no action after concluding they had a year to pay it. 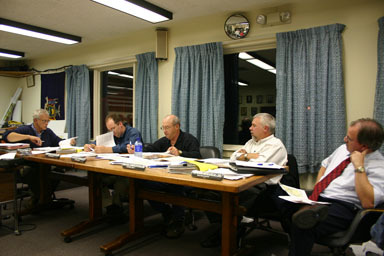 Town Board discussing Autoworks special permit. Also, there was discussion of a preliminary report on the Dryden-Freeville trail, which I'll need to get and post here. It sounds like the grant will likely cover only from the current northern end of the Jim Schug trail to Springhouse Road. That would extend the trail while avoiding a continuing discussion with a landowner on the other side of Springhouse Road. This morning's Journal is quiet about Dryden, except for a mention in an article about how Hanshaw Road got its name. In the print edition, Elia Kacapyr looks over September's business activity and calculates that Tompkins County's economy is currently on track to grow about 3% in 2005. It was a perfect day for a hike, and a perfect day for a Hammond Hill trail fixup day. This one ran a little differently from last year, so I followed a crew around and took pictures of them, though there were at least five other crews out there. Removing fallen trees and clearing brush were the main duties of the group I followed, with Michael Ludgate and his chainsaw leading the way. 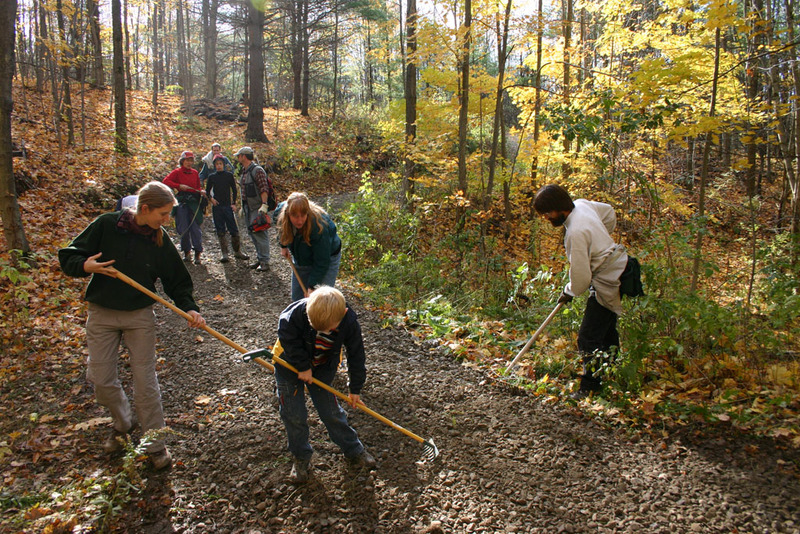 On our return from a two-hour trek around Hammond Hill, we found the gravel crew finishing up repairs to the Yellow One trail. 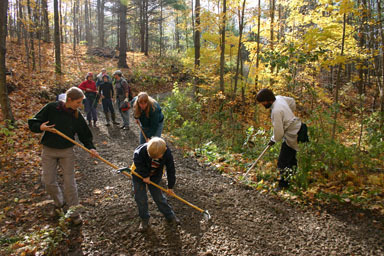 Raking fresh gravel to smooth out a trail. I've posted a few more pictures, including some of snow, in a gallery. I stopped by Neptune Hose Company tonight and was amazed by the number of explorers, Darth Vaders, princesses, pirates, and other unusual characters who had shown up for the costume judging. Gathering round for the costume judging. 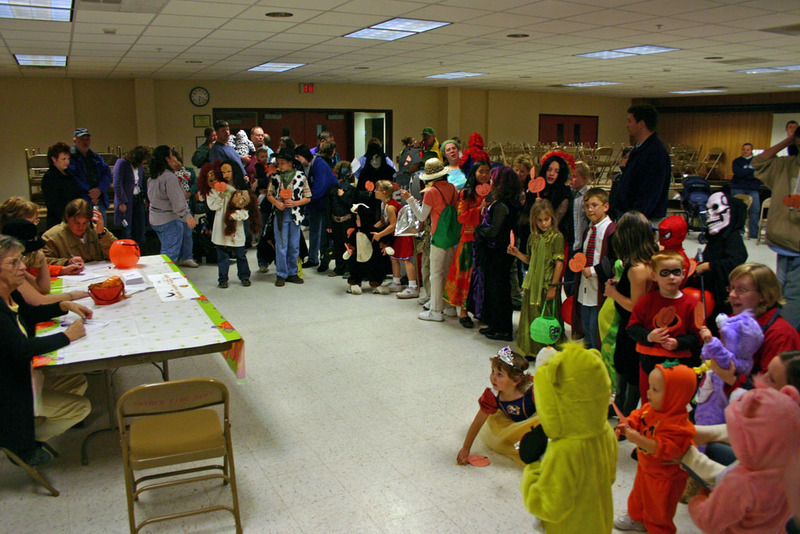 The event, sponsored by Neptune Hose Company and the Dryden American Legion, started with the costume contest in the meeting area of Dryden Fire Hall and then moved into the vehicle bays for cider, candy, donuts, coffee, and of course firetruck rides. A small fireman climbs off the firetruck. There are lots and lots more pictures in the gallery, and I scanned in the program (255KB PDF).